Willie Nelson performs during Keith Urban's Fourth annual We're All For The Hall benefit concert at Bridgestone Arena on April 16, 2013 in Nashville, Tennessee. NASHVILLE, Tenn. (AP) — America loves its outlaws, and few are as admired and lionized as Willie Nelson. As the enduring American icon's 80th birthday has approached, he's been honored with lifetime achievement awards, serenaded at special performances and saluted by musicians from every genre of music. And Nelson has taken it all in with a bemused smile. The singer whose birthday is Monday or Tuesday — Nelson says April 29, the state of Texas claims April 30 — occupies a unique space in America's cultural memory. A walking bag of contradictions, he wears his hair long in braids and has a penchant for pot smoking, yet remains arguably conservative country music's greatest songwriter. He's accepted by left and right, black and white and is instantly recognizable to a majority of Americans. Like few other music stars, his image has grown to represent more than the notes he's played or the lyrics he's written. Like Elvis Presley, Johnny Cash or Frank Sinatra, he's become a figurehead for a uniquely American way of thinking. He represents the outlaw and the maverick. If Elvis was all about the pelvis and the sexual revolution, Nelson is American independence: the raised middle finger tossed with a twinkle in the eye. "America is a bizarre place and Willie is our captain," said Jamey Johnson, Nelson's good friend and sometimes opener. "Willie in every way represents all the greatest things about America to me." Nelson didn't set out to be a folk hero, as Charles Kelley of Lady Antebellum calls him. He spends something like 200 days on the road still, a pace that challenges men a quarter his age. In a series of interviews over the last year, Nelson explained he just came to Nashville wanting someone to buy his songs. That young man never imagined he'd be on the road for more than 50 years. His first real songwriting job paid $50 a week. He played — and sometimes slept — at Tootsie's on Lower Broadway in Nashville, just a few miles — but really a million miles — away from Music Row. Nelson thinks that young man wouldn't know what to make of the spectacle he's become. "He'd probably wonder what's that old man doing out there," Nelson said with a chuckle. "He's got a house. He's not homeless. Why don't he go home?" What: Show with Lukas Nelson and the Promise of the Real, Paula Nelson Band and Folk Uke, benefiting the volunteer fire department of West. Cash and gift cards will be collected. 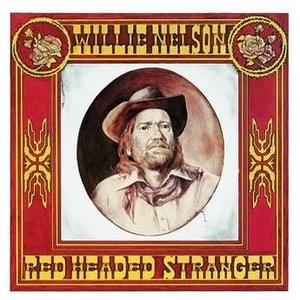 The concert will air live on SiriusXM’s Willie’s Roadhouse channel beginning at 8 p.m. It’ll also be rebroadcast Tuesday — the day Nelson turns 80 — at 7 p.m.
• Our Happy Birthday, Willie, video card, featuring faces famous and not. And our birthday photo gallery (it’s not too late to add yours). • A Willie song list. • Tons of past stories on the Family, Sister Bobbie, Willie and Darrel Royal, shows, the statue and more. From old hippies with weathered faces to college students in flip flops, a sold-out crowd poured into The Backyard at Bee Cave Sunday for a special treat. 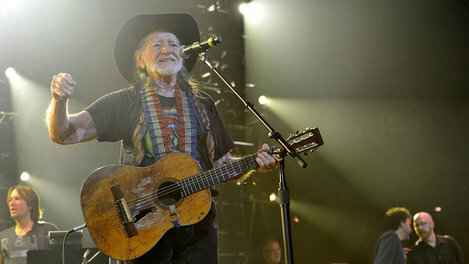 The concert was a celebration of Willie Nelson's 80th birthday and a benefit for residents of West. I'll just tack this post on to Willie's 80th birthday thread. 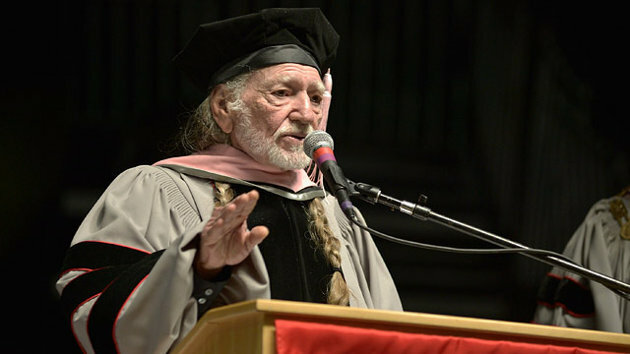 Country music legend Willie Nelson has been named an honorary doctor - of music. The 80-year-old Texan was honored Saturday by the Berklee College of Music in Boston, along with musicians Carole King and Annie Lennox. "I was going to ask them if I could write my own medication," Nelson told the Boston Globe before the ceremony. "Probably not, but it doesn't hurt to ask." The new "doctor" seemed to revel in his title, tweeting a picture of himself sporting his trademark long braids and wearing graduation regalia. "Dr Willie looks great," he wrote. Lennox, best known as one half of the Eurythmics duo, delivered the commencement speech to more than 1,050 graduating students and their guests at Agganis Arena, one night after she and Nelson took to the stage separately to perform with students at the school's commencement concert. Berklee has previously bestowed the honor on some of the most influential names in music, including Smokey Robinson, Aretha Franklin and David Bowie, according to the school's website. Love the updates on Willie...love him. WEST, Texas -- Town leaders from West, Texas, and neighboring Abbott were all smiles on Monday afternoon as a representative for country music star Willie Nelson gave donated checks totaling more than $120,000. Most of the money was raised at a benefit birthday concert Nelson hosted a few weeks ago in Austin. More than $80,000 was donated to the West Volunteer Fire Department. Abbott got more than $40,000, some of which will be used to help buy a new truck they lost in the explosion of the April 17 fertilizer plant fire. Abbott is known as the birthplace of Willie Nelson. West Volunteer Fire Chief George Nors Sr. was also on hand after finally being released from the hospital. According to a News 8 tally of different relief funds set up after the explosion, more than $3.5 million has been raised. This year’s Farm Aid concert is completely sold out. The annual benefit concert, which takes place in Saratoga Springs, N.Y. this year, filled all of its 25,000 seats just days after going on sale last Friday (June 28). This year’s concert will feature performances from Farm Aid board members Willie Nelson, John Mellencamp, Neil Young and Dave Matthews. They will be joined by an all-star lineup that includes Jack Johnson, Amos Lee, Toad the Wet Sprocket, Lukas Nelson & P.O.T.R., Bahamas, JD & The Straight Shot, Carlene Carter and Pegi Young & the Survivors. Hot newcomer Kacey Musgraves will also perform. This year’s Farm Aid concert will take place at the Saratoga Performing Arts Center (SPAC) in Saratoga Springs, N.Y. on Sept. 21. 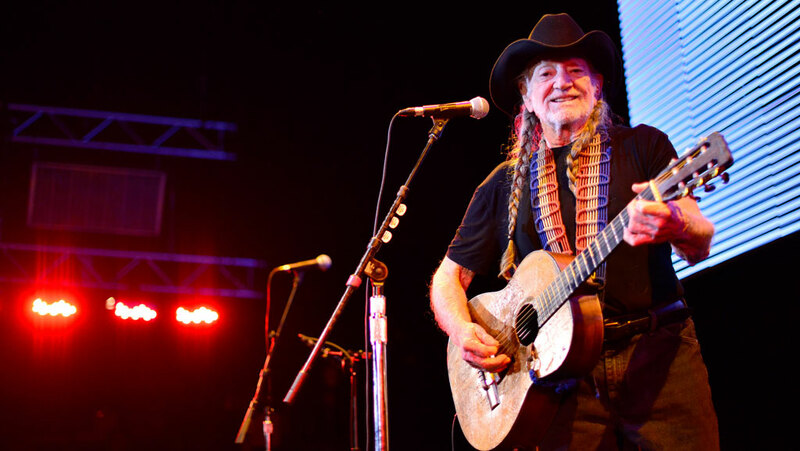 Willie Nelson has called on some of the top female vocalists in the world for his next album. ‘To All the Girls…’ features Nelson in duets with the greatest female voices from across all genres. The album is the third new project Nelson has recorded under his new deal with Legacy Recordings, a division of Sony. 2012′s ‘Heroes’ and ‘Let’s Face the Music and Dance,’ which was just released in April, have both scored big success for the 80-year-old music icon. ‘To All the Girls…’ features guest appearances from some of the best singers in country, bluegrass, Americana, gospel and more. Carrie Underwood, Loretta Lynn, Dolly Parton, Miranda Lambert, the Secret Sisters, Roseanne Cash, Sheryl Crow, Wynonna Judd, Alison Krauss, Melonie Cannon, Mavis Staples, Norah Jones, Shelby Lynne, Emmylou Harris, Lily Meola, Brandi Carlile, Paula Nelson and Tina Rose all lend their talents to the 18-track project. The album is set for release on Sept. 24. AUSTIN (KXAN) - Jody Payne, former guitarist for Willie Nelson, died Saturday, Aug. 10, according to Willie Nelson's Facebook page. **He always called himself 'Lonesome Loser' (Little River Band) too, after I told him to GTFO, lol. I think Willis is 80 years young. Two very wonderful songs, Nut. 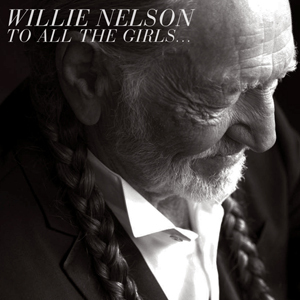 Willie Nelson’s latest album, ‘To All the Girls …’ has debuted at No. 9 on Billboard’s Hot 200 chart. It also takes the No. 2 spot on their Top Country Albums chart. The chart placement marks the 80-year-old’s highest position on the popular albums chart since his 1982 record, ‘Always on My Mind,’ which stayed at No. 2 for three weeks when it was released. ‘To All the Girls…’ is an album of duets with some of Nelson’s favorite female singers, including Loretta Lynn, Miranda Lambert, Sheryl Crow, Rosanne Cash and Carrie Underwood. The record is his third release on Sony’s Legacy Recordings. 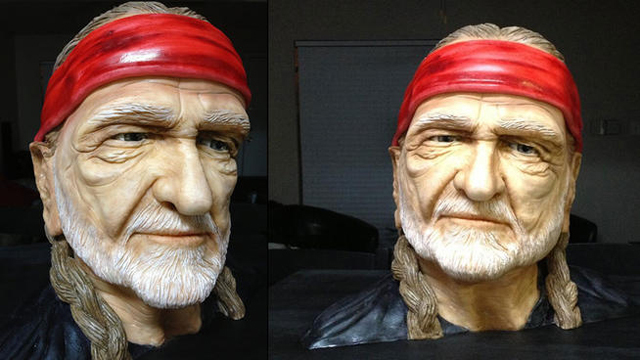 Austin baker Natalie Sideserf doesn't even have her own retail store yet, but she's already making waves with her startlingly realistic Willie Nelson cake. Her confectionery bust of the Red Headed Stranger swept all divisions of the Sugar Art Show and Cake Competition and racked up 1.2 million views on Reddit when her brother posted the photo online. Nelson stars in Angels Sing, a movie written by Austin writer Turk Pipkin, alongside Harry Connick Jr., "Friday Night Lights" star Connie Britton and fellow country singers Lyle Lovett and Kris Kristofferson. The movie was filmed in Austin and Bastrop, and Nelson spoke to KVUE about working so close to home. "There [are] a lot of Austin musicians, talent, actors, and it was filmed around here so naturally, everybody knew about it and a lot of people around here participated in it," Nelson said. "Angels Sing" is rated PG and is now playing in select theaters. Page created in 2.158 seconds with 21 queries.